Cambodia has always been on our itinerary, but we originally thought we would visit as part of an overland trip between Thailand and Vietnam. Instead, we ended up visiting it directly after our trip to Bali. Our friend Andrew from Denver works with an NGO in Cambodia a few months out of the year, and we found out that he would be there in February, so we switched our schedule up. Our first stop in Cambodia was the capital and its largest city, Phnom Penh. We spent four nights there exploring many different sides of the city: seat of royalty, echoes of past horrors, and glimpses of a growing modernity. We actually ended up staying in two different hotels during our time in Phnom Penh. The first two nights we stayed at the Khmer Surin Boutique Hotel, because that is where Andrew always stays and he was able to get us a slightly reduced rate. The room was definitely fancier than we were used to! We really enjoyed the large breakfast, where our choices included noodle soup and pad thai. Even with the discount though, it was still a little too much for our budget. 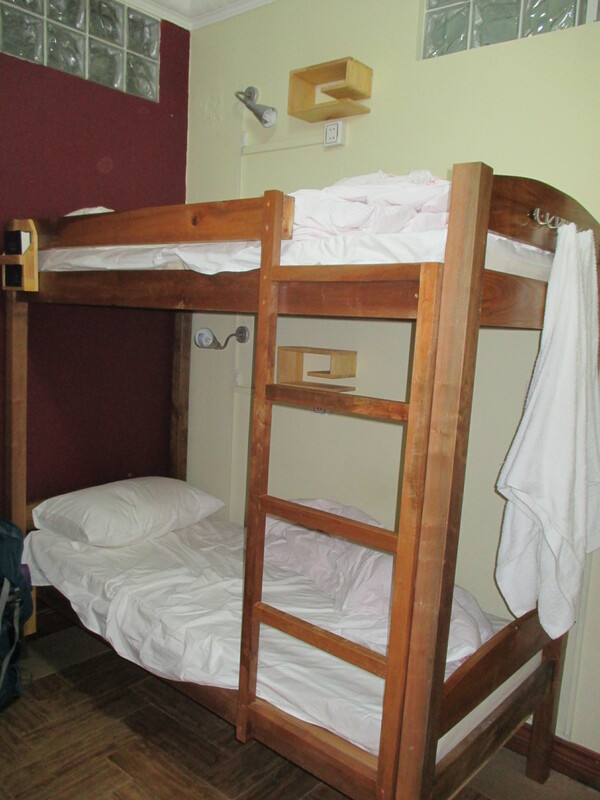 We found the Envoy Hostel just six blocks away and got a private room there with a shared bathroom. Its included breakfast was good but not nearly as fancy, but the space itself felt new, clean and friendly. Royal Palace – Cambodia is a constitutional monarchy, meaning that they have a prime minister with most of the political power but they also still have a King (like England). The King’s official residence is in Phnom Penh, and parts of it can be visited by the public. The two major attractions to see are the Throne Hall, a lavish hall where the King receives visiting dignitaries, and the Silver Pagoda, which houses many splendid objects and gets it names from the actual silver floor tiles. We weren’t allowed to take pictures inside either of these structures, but were allowed to take pictures of the outside and the surrounding buildings, which were pretty impressive. National Museum – Located next to the Royal Palace, this museum houses a large collection of ancient Khmer artifacts (the people of Cambodia are not called Cambodians but rather Khmer). It was interesting to observe the changing majority religion in the Khmer Empire as time went on. The earliest sculpture from before the 10th century AD is all Hindu, with images of Vishnu and Shiva, and so on. The apex of the Khmer empire is called the Angkor period (named after the capital, where the famous Angkor Wat is located). The sculpture from the early Angkor period is still Hindu, but then shifts to Buddhist under the influence of some influential kings. After visiting the exhibits, we spent some time relaxing in a pleasant garden in the center courtyard. Both of the above attractions would fit under the “positive vibes” category, but the other two major attractions we visited definitely do not. In 1975, in the chaos surrounding the Vietnam War, the Khmer Rouge took power in Cambodia and began a radical restructuring of the country. Cities were emptied and they attempted to make an agrarian Communist society. Part of this restructuring meant getting rid of anyone who didn’t fit into their plans, such as intellectuals, foreigners, or even Khmer Rouge members who didn’t seem “loyal” enough. They only ruled until 1979, but in that time over 2 million people died. We visited two attractions that played a major part in this genocide. Tuol Sleng Genocide Museum – This is also known as “S-21”, which was the name given to it by the Khmer Rouge when it was used as a secret prison. They used this former high school to house prisoners for long enough to torture them and force a confession for their “crimes.” The facility is left is almost the same state as it was when the Khmer Rouge fled Phnom Penh in 1979. One of the cell blocks still contains the beds in which some of the last remaining prisoners were tortured to death and left before they fled. Others still have the old makeshift cells that the prisoners were held in. Many of the rooms are filled with pictures of the victims; like the Nazis, the Khmer Rouge liked to keep detailed records. This was a pretty harrowing place to visit, to say the least. Killing Fields of Choeung Ek – After the prisoners “confessed” to their crimes, they would be thrown in the back of a truck and taken out to this site (located in a former Chinese cemetery) just outside of town, killed and dumped in a mass grave. In an attempt to save bullets, most of the killings were done with agricultural instruments. No structures remain, but many of the mass graves have been unearthed. Not all of them have though, and you can still see scraps of fabric and even bits of bone from the victims sticking out of the ground in places. An excellent audio guide helps take you through the site and gives good background information. We also really appreciated that the audio guide meant that hardly anyone was talking throughout the site, leading to an air of solemnity. There are many bone fragments that still come to the surface. You have to be careful not to step on them. After learning about all of these recent horrors, we were feeling pretty depressed. But, the people of Phnom Penh seem pretty resilient, and we got to participate in a fun local activity at the Olympic Stadium one evening. Our friend Andrew did a great job of guiding us through the wide range of good food that was to be found in the neighborhood that we stayed in. The variety and quality was quite impressive! The first night we went to a barbecue place that was filled more with Khmer people than with foreigners. We split a few different grilled meats and side dishes. One of the most exciting parts of the evening was seeing a Rice hat at a neighboring table! On the other evenings with Andrew, we ate at a French restaurant (a holdover from the colonial influence) and a Mexican restaurant (where Eric was amused to see many Texas references on the menu). One evening Andrew couldn’t join us, so we ate at the Khmer Surin’s restaurant and had some dishes with a strong Thai influence. We also ate lunch one afternoon at Mok Mony, where we sampled a Khmer red curry (tasted pretty similar to Thai curries) and their version of fried noodles. One thing that we were really impressed with was how cheap the beer was! At many places, you could get a glass of draft beer during happy hour for 75 cents! Sure, it was pretty plain tasting beer, but at that price it’s hard to complain! Phnom Penh was an excellent introduction to modern Cambodia. We got to see a bit of the royal influence, learn about both the grand ancient history and the somber modern history, and get a little bit of the cosmopolitan feel of the growing city. It was really fun to see you guys! Thanks again for moving your schedule around to be in Phnom Penh when I was here. And I really enjoyed reading the write-up from your time here. Very well done. Burma was fantastic, I look forward to sharing stories together this summer in Colorado!